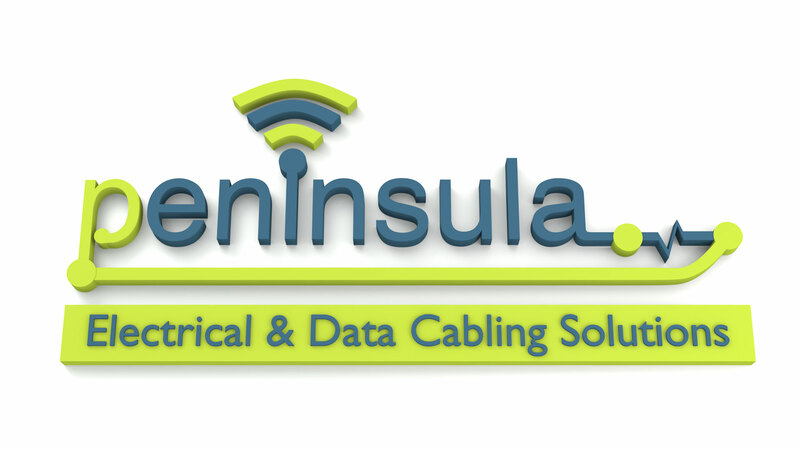 Peninsula Solutions Exeter, Fibre Optic Data Cabling, has teamed up with EXCEL as one of their recognised Data Cabling Partners. EXCEL is therefore our Fibre Optic preferred supplier on our fibre optic installations. Fibre optic systems have the benefit over copper with respect to the maximum achievable distance. Copper is limited, for a standards compliant installation, in general to a maximum of a 90m, whereas fibre may support some applications for several kilometres. For this reason fibre optic has traditionally been used in the backbone, typically linking telecommunication rooms and separate buildings with copper cabling being utilised for the desktop connection. The backbone encompasses links between buildings. The backbone is not the exclusive use of fibre optic cabling. Customers are deploying fibre in the desktop connection element of the infrastructure; sometimes referred to as Fibre To The Desk (FTTD). Fibre Optic cabling can be split into two families; Multimode and Singlemode. “Mode” means path, so the light travels down multi and single paths respectively. Multimode can use less expensive LED and VCSEL light sources to transmit the signal whereas Singlemode requires a laser to transmit the signal along a single path. Lasers offer a high powered signal that can be transmitted for greater distances. However, the active equipment is a higher price than that of multimode. Singlemode fibre is typically 9/125μm and currently readily available in two categories – OS1 & OS2. 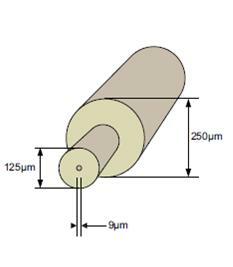 OS1 is available in both loose tube and tight buffer constructions. 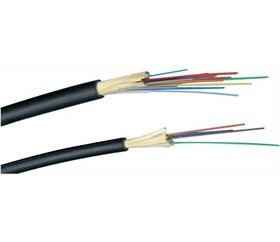 The newer OS2 cabled optical fibre is a low water peak grade of fibre (ITU G.652D). Until recently Excel tight buffed fibre cable along with the majority of the market, would support OS1 only. Recent developments of the product has improved the performance and Excel tight buffed singlemode fibre supports OS2. OS2 tight buffered cable is rare in the market. The low water peak refers to the improved performance around the 1383 nm window. The nature of singlemode having one path for the light, and that the transmitting source is a laser, results in a high power and therefore greater distances being achieved. The smaller core size used in singlemode necessitates tighter tolerances being employed for the production of the connector components and couplers. 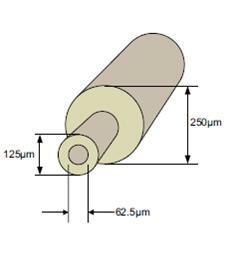 Two common dimensions exist for multimode, 62.5/125μm and 50/125μm and is available in four categories – OM1 (62.5/125), OM2 (50/125), OM3 (50/125) & OM4 (50/125). OM2 is available in either of these two sizes (although 62.5/125μm is rare). Care must be taken not to mix the sizes within a system as they are not interoperable. All of the Excel OM2 Optical Fibre products are 50/125μm. For new installations the recommendation is to standardise on OM3. Consideration should be given to OM4 for support of the emerging 40 & 100 Gigabit Ethernet standards. These will be accomplished with parallel optics which will influence the connector selection. The EXCEL range of internal/external grade of fibre cables are available in a choice of loose tube or tight buffered designs. EXCEL has worked extensively to provide singlemode fibre cables performing to the OS2 category in all constructions. The Central Loose Tube Fibre cables are constructed around a silica gel filled tube containing up to 24 colour coded 250um buffered 62.5/125um. Multimode is covered with aramid strength members and a flame retardant and low smoke halogen free, outer sheath. Features include; LSOH black sheath, Duct grade, suitable for internal and external use, 25 year system warranty. Able to carry larger amounts of data. Fiber optic cables have a much greater bandwidth than copper cabling. Fiber optic cables are much thinner and lighter than copper cabling wires. Fiber optic cables are less susceptible than copper cabling to interference. Data can be transmitted digitally.